Text "CUSTARD" to short code 91944 to receive informational alerts. 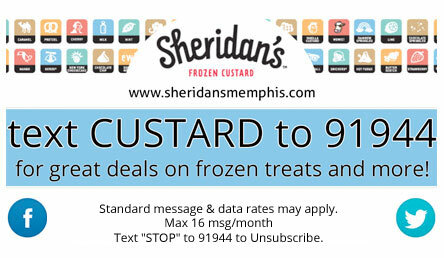 Sheridan's Frozen Custard LLC, ("the Company," "we," or "us") provides the registered users of the website http://www.sheridansmemphis.com/ with certain services ("Services"). This Sheridan's Frozen Custard User Agreement is the legal agreement ("Agreement") between you and Sheridan's Frozen Custard governing your use of these Services. Please read this Agreement carefully. Sheridan's Frozen Custard is willing to provide the Services to you only on the condition that you accept all of the terms and conditions contained in this Agreement. You accept the terms and conditions of this Agreement by registering for and using the Services. If you are unwilling to accept this Agreement, do not use the Services. Subject to your compliance with the terms and conditions of this Agreement, Sheridan's Frozen Custard will provide the Services to you after you have successfully and voluntarily opted in to Sheridan's Frozen Custard campaign. Upon Sheridan's Frozen Custard's acceptance of your opt-in SMS text message for participation in the Services, Sheridan's Frozen Custard will send you an SMS text message containing a response administered by Sheridan's Frozen Custard. The communication standards for the Services include, but are not limited to: SMS and web-based browser technology, provided that in order to use the Services, you must maintain an active account with a carrier of electronic communications through mobile devices (each, a "Carrier"). 16 messages per month. At no time will Sheridan's Frozen Custard charge a "premium" fee nor solicit any type of payment, such as a bank account number or credit card number, from a user. Sheridan's Frozen Custard will only engage in "standard" text messaging campaigns which will only be subject to the standard text messaging fees charged by the user's wireless carriers. You acknowledge and agree that the availability of SMS and your ability to use the Services is on an "AS IS" and "AS AVAILABLE" basis. You acknowledge that delivery of SMS messages and availability of web-based browsing is not guaranteed. You acknowledge that the Services may differ depending on the Carrier with whom you maintain an account and that Carrier's ability to support the Services. Sheridan's Frozen Custard is not responsible for the act or omission of any Carrier, any limitations imposed by such Carrier, or such Carrier's ability or inability to support the Services. In addition, Sheridan's Frozen Custard is not responsible for any limitations of the internet. In the event your Carrier fails to deliver any communication to Sheridan's Frozen Custard or a provider of any Product in timely fashion, due to, but not limited to, mobile network failure or non-compatibility of your phone model with the Services, you acknowledge and agree that Sheridan's Frozen Custard shall not be liable for any loss or damage. In addition and without limiting the foregoing, in no event will Sheridan's Frozen Custard be liable for any error by you in using the Services. Sheridan's Frozen Custard reserves the right, in its sole discretion, to modify the Services from time to time and without notice. Sheridan's Frozen Custard shall have no liability to you for any modification or discontinuation of the Services. If you object to any such changes, your sole recourse shall be to cease using the Services. Continued use of the Services following any such changes shall indicate your acknowledgment of such changes and satisfaction with the Services as so modified. You may not attempt, or authorize, encourage, or support others' attempts, to circumvent, reverse engineer, decrypt, break or otherwise alter or interfere with the Service. You agree to advise Sheridan's Frozen Custard promptly of any such unauthorized use(s) or attempt(s). You acknowledge and agree that the Services are for your personal use only. You acknowledge and agree that you may not copy, distribute, sell, resell, or exploit for any commercial purposes any portion of the Services, or any products accessible through the Services. Sheridan's Frozen Custard is not liable for any claims, actions, damages, or other liability incurred as a result of any unauthorized use of your account or the Services, and you agree to be fully liable for any such unauthorized access. Sheridan's Frozen Custard may amend, supplement, or modify this Agreement from time to time by posting the amended Agreement on http://www.sheridansmemphis.com/, and you agree to be bound by any such amendment or modification. If you object to any such changes, your sole recourse shall be to cease using the Services. Continued use of the Services following posting of any such changes shall indicate your acknowledgment of such changes and agreement to be bound by the revised Agreement, inclusive of such changes. Sheridan's Frozen Custard may suspend your ability to use the Services or may terminate this Agreement effective immediately and without notice to you if Sheridan's Frozen Custard believes you have violated or acted inconsistently with the letter or the spirit of this Agreement. YOU AGREE THAT Sheridan's Frozen Custard SHALL NOT BE LIABLE TO YOU FOR ANY TERMINATION OF THIS AGREEMENT OR OF YOUR ACCESS TO THE SERVICES. You may discontinue your participation in and access to the Services at any time by delivering notice to Sheridan's Frozen Custard at support@yourareacode.com, or by sending a text message to the Sheridan's Frozen Custard shortcode (91944) with the message STOP to Unsubscribe. YOU EXPRESSLY AGREE THAT USE OF THE SERVICES IS AT YOUR OWN RISK. THE SERVICES ARE PROVIDED ON AN "AS IS" AND "AS AVAILABLE" BASIS. Sheridan's Frozen Custard EXPRESSLY DISCLAIMS ALL WARRANTIES OF ANY KIND, WHETHER EXPRESS, IMPLIED, OR STATUTORY, INCLUDING, BUT NOT LIMITED TO, THE IMPLIED WARRANTIES OF MERCHANTABILITY, FITNESS FOR A PARTICULAR USE OR PURPOSE, AND NON-INFRINGEMENT. Sheridan's Frozen Custard MAKES NO WARRANTY THAT THE SERVICES WILL MEET YOUR REQUIREMENTS, OR THAT THE SERVICES WILL BE UNINTERRUPTED, TIMELY, SECURE, OR ERROR FREE. Sheridan's Frozen Custard DOES NOT WARRANT, GUARANTEE, OR MAKE ANY REPRESENTATIONS REGARDING THE USE OR THE RESULTS OF THE USE OF THE SERVICES WITH RESPECT TO PERFORMANCE, ACCURACY, RELIABILITY, SECURITY CAPABILITY, CURRENTNESS OR OTHERWISE. YOU UNDERSTAND AND AGREE THAT ANY PRODUCTS YOU OBTAIN THROUGH USE OF THE SERVICES IS DONE AT YOUR OWN DISCRETION AND RISK, AND Sheridan's Frozen Custard MAKES NO WARRANTY REGARDING ANY DEALINGS WITH OR TRANSACTIONS ENTERED INTO WITH ANY OTHER PARTIES THROUGH THE SERVICES. THE ENTIRE RISK AS TO SATISFACTORY QUALITY, PERFORMANCE, ACCURACY, EFFORTS AND RESULTS TO BE OBTAINED THROUGH THE USE OF THE SITES OR THE SERVICES IS WITH YOU. NO ADVICE OR INFORMATION, WHETHER ORAL OR WRITTEN, OBTAINED BY YOU FROM Sheridan's Frozen Custard OR THROUGH THE SERVICES SHALL CREATE ANY WARRANTY NOT EXPRESSLY MADE HEREIN. YOU UNDERSTAND THAT TO THE EXTENT PERMITTED UNDER APPLICABLE LAW, IN NO EVENT WILL Sheridan's Frozen Custard OR ITS OFFICERS, DIRECTORS, EMPLOYEES, AFFILIATES, AGENTS OR LICENSORS BE LIABLE FOR ANY INDIRECT, INCIDENTAL, SPECIAL, CONSEQUENTIAL OR EXEMPLARY DAMAGES, INCLUDING, BUT NOT LIMITED TO, DAMAGES FOR LOSS OF REVENUES, PROFITS, GOODWILL, USE, DATA OR OTHER INTANGIBLE LOSSES (EVEN IF SUCH PARTIES WERE ADVISED OF THE POSSIBILITY OF SUCH DAMAGES), ARISING OUT OF OR RELATED TO YOUR USE OF THE SITES OR THE SERVICES, REGARDLESS OF WHETHER SUCH DAMAGES ARE BASED ON CONTRACT, TORT (INCLUDING NEGLIGENCE AND STRICT LIABILITY), WARRANTY, STATUTE OR OTHERWISE. THE PARTIES ACKNOWLEDGE THAT THE TERMS OF THIS SECTION 10 REFLECT THE ALLOCATION OF RISK SET FORTH IN THIS AGREEMENT AND THAT THE PARTIES WOULD NOT ENTER INTO THIS AGREEMENT WITHOUT THESE LIMITATIONS OF LIABILITY. THE AGGREGATE LIABILITY OF Sheridan's Frozen Custard TO YOU FOR ALL CLAIMS ARISING FROM OR RELATED TO THE SITES OR THE SERVICES IS LIMITED TO ONE HUNDRED DOLLARS ($100).